Do Bold Outfits Win Matches? On Day 11 of the U.S. Open, The Daily Beast’s Touré tests his tennis theory—the loud shots and sartorial flair always win out—on the del Potro-Cilic quarterfinal. There are many ways to quickly predict who’ll win a modern pro tennis match. I pay attention to two dynamics: sound and sartorial flair. I listen to the sound the ball makes as it comes off of a pro’s racket. Is it a brief, loud, hard sound—and how brief, loud, and hard is it? You can tell how much damage he does to the ball through the ears. If one guy’s ball is much louder and nastier than the other’s, he’s probably going to win, unless he’s really inconsistent. I also look at their clothes. If one guy has a far more fashion-forward and sartorially aggressive uniform than the other, he’s probably going to win. This isn’t as shallow as it sounds. Rafael Nadal has rumbled through the tournament in a bumblebee yellow shirt accented by a rich, deep, electric turquoise, his shorts black and, as always, as long as if they were short Bermuda pants. Roger Federer has glided through in a stylish black shirt with blood red trim, as if to signal there will be blood. And Juan Martín del Potro of Argentina, the world’s sixth-best player, is fighting in a black sleeveless shirt with bumblebee-yellow wristbands and headband, definitely something Nadal would’ve worn last year. Del Potro hits a heavy ball. It makes a loud, crisp, mean sound. Sometimes the ball coming off his strings sounds like a gunshot—a far louder, more damaging sound than that made by Marin Cilic, his opponent on Thursday. It was an interesting matchup of 20-year-old 6-foot-6 guys, but the Croatian Cilic wore a far more traditionally colored and visually boring outfit: white shirt with some lines and dark shorts. • Check out The Daily Beast's latest U.S. Open photos and reports If a guy is both louder off his strings and more fashion-forward, I think he should win. So because del Potro’s shots are louder and his outfit bolder—and because he made the Australian quarters last winter and the French semis last spring while Cilic had never gotten past the fourth round in any slam—I figured he’d take it. It worked. Del Potro started hitting harder and making fewer mistakes. He’s got the mind of a clay court-raised aggressive baseliner—he wants to stay back and hit screamers at the lines, doesn’t want to come in to net but can, and has the legs and lungs to run down lots of balls. He’s also got a big man’s serve, often 120 mph and above, with lots of aces and weak returns that lead to winners. An hour and a half later, del Potro had gone from down a break in the second to winning the second 6-3, the third 6-2, and up 5-0 in the fourth. Dominance. Cilic won one game after that, almost just to save face. Del Potro had been down a set and a break, turned on a dime, and after that lost just four games over three sets. The flip-flop nature of the match—it was really like two opposite matches in one—was encapsulated in one long break point against Cilic in the third set, when the match seemed to be teetering between them. Twice on the same point the ball hit the top of the let cord and leapt up, changing a sure winner into a sitter that lengthened the rally. On this same long point, both men rushed into the net, hit some volleys, then found themselves lobbed back to the baseline—the momentum shifting radically several times. In the end, Cilic pinned del Potro in the corner, closed in on the net, had him dead to rights, and then the Argentine hit a great, unexpected, back to the wall crosscourt pass. It broke Cilic’s serve and, perhaps, his resolve. Del Potro will be around for a while. Don’t miss him on Saturday, especially if plays the great Nadal. They’re both fashion-forward, but I think Nadal’s shots are a little louder. 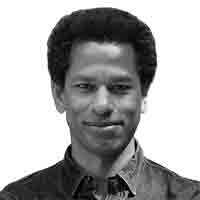 Touré is a columnist for The Daily Beast. He's also an NBC contributor and the author of Never Drank the Kool-Aid, Soul City, and The Portable Promised Land. He is a contributing editor at Rolling Stone, was CNN's first pop culture correspondent, and was the host of MTV2's Spoke N Heard. His writing has appeared in the New Yorker and the New York Times.